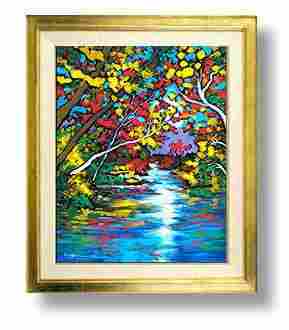 This collection of paintings is done in the fauvist style. 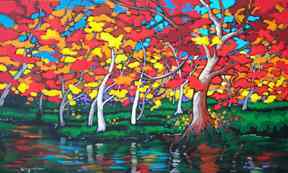 Fauvism is a painting style that was started by a group of French artists in the early 1900's. The word "fauve" means "wild animal" and this type of painting accentuates wild and intense colors and abstracted forms. It's a lot of fun to play around with this style! Red, yellow and orange leaves rustle in an autumn breeze. I love to take natural objects such as trees and ponds and find designs within their shapes and vary the patterns and sizes of those designs. My goal is to get the shapes to move and spin in a dance of life and light. 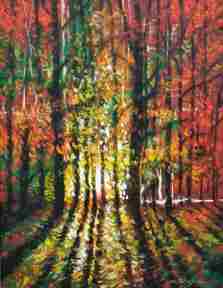 Light behind trees shine through the trunks causing long shadows to fall across the ground before them. 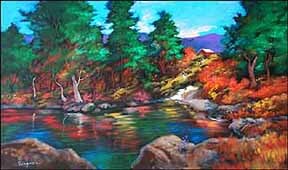 In this painting I was interested in the abstract shapes that were created by the streams of light protruding into the foreground. Stately trees majestically cast shadows and reflections into the pond below. A rustic cabin overlooks the peaceful scene -- a perfect autumn getaway. The forest seems to call to me to explore and walk among the leaves that shimmer in the breeze. What mysteries await me?